Thank you, dear Midnight Poutine reader, for the Riz en Folie recommendation! One of our readers sent us glowing praise about this new place, and wary as I was, I decided to check the place out. And wow - am I ever glad I did. 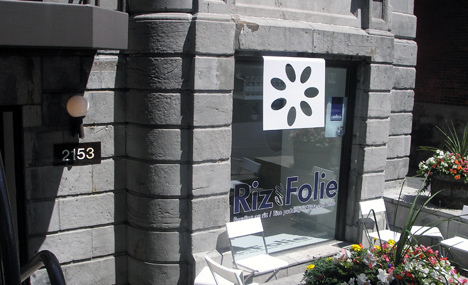 Riz en Folie is a new downtown resident, recently opening its doors on Mackay in late July. At first, I was wary...a resto serving only rice pudding? Sounded like a gimmick to me. But after visiting the place and sampling some of its goods, all hesitation was set aside. Forget ice cream - this is the new (and dare I say better?) snack of summer (and probably fall, winter and spring too). First of all, the place is gorgeous. Brightly lit and entirely decorated in white, I felt I had entered a place of pristine cleanliness. 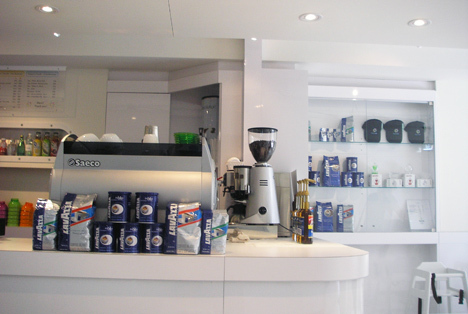 Shocks of colour on the tabletops and behind the counter added to the atmosphere. 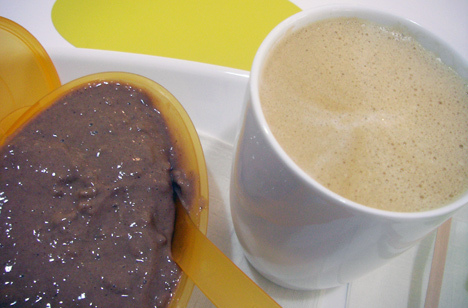 When I walked in, I admired the stylish bowls of rice puddings, and was immediately served. After being offered several sample spoonfuls of the dozen or so flavours of rice puddings (take note - they are more than happy to accommodate any curiosity you may have!) - I asked for a serving of the most interesting pudding, and was suggested a bowl of the chocolate diabolique, or, a spicy chocolate rice pudding. The layers of flavours in th pudding was incredible; it was rich and chocolately, but had a depth of cinnamon to it. It was perfectly creamy, and the rice was expertly prepared - not chewy in the least, and not mushy. My other order was the passion fruit rice pudding, and this was utterly decadent. It was bright and tangy, bursting with fruit flavour. I have to admit: my tastebuds tingled. I was offered samples of other puddings as well. The coconut rice pudding was rich and tropical. The pistachio was better than any pistachio ice cream I have ever tried. Finally, I sampled a chocolate rice pudding laden with marshmallows and pecans. Um....hello, heaven? Other flavours, such as creme brulee and chocolate-mint, will guarantee a return visit from me. The final thing that had me convinced that Riz en Folie is a Montreal landmark in the making is its green approach. 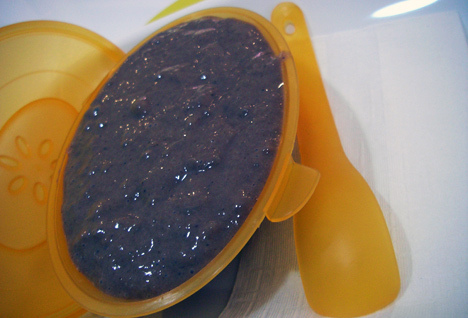 The puddings are sold in vibrantly coloured plastic dishes that you can take home with you - spoon and lid included. These dishes are microwave safe, and can be reused at the resto - if you bring your dish back (they even have sink where you can wash them! ), they'll give you $0.25 off the $4.00 price of a pudding. $4.00 for absolutely decadent rice pudding, plus a reusable container? Riz en Folie, you're a resto to be reckoned with. And the coffee? Fantastic! 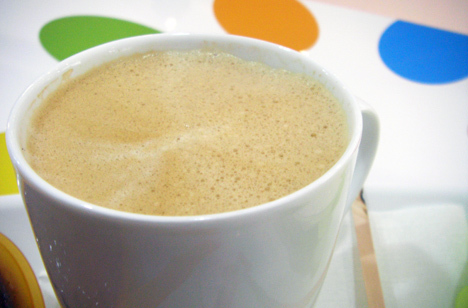 I had a cafe au lait that beat out even Little Italy's offerings. For some of the friendliest service you'll ever get, and for a dessert that rivals even the best gelato, check out Riz en Folie. You won't be disappointed. the kokoloco and passion fruit flavours are amazing. This chain is called Rice to Riches in NYC. i am going there very very soon, hopefully. it sounds so great! This place is fantastic! I stumbled on it while wandering around downtown. The owner was so friendly and accommodating. I need to get there fast! Sounds like NYC's Rice to Riches. Yay for Montreal! the strawberry-rhubarb flavour was fantastic. spicy chocolate was a crowd favorite. I'm happy to be hearing so many happy responses to this place! I can't wait to make a return trip; all I've been hearing about is this rhubarb pudding, which is in my must-have-now list. I love a good traditional rice pudding; it brings back found memories of home, but why stops there? RIZ EN FOLIE make a big difference to me I went there this weekend and I found this place wonderful, the concept speaks for itself. 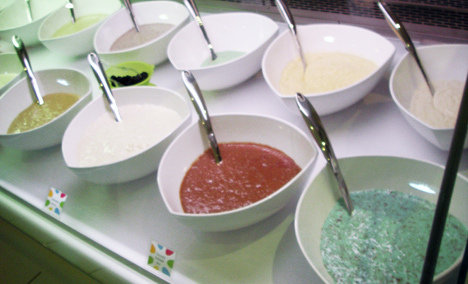 Over 20 different flavours of rice pudding designed to compete with ice cream and yogurt treats. 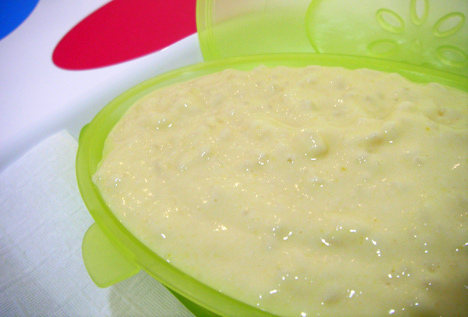 The rice pudding in this place is deliciously smooth, is also light and diabetic friendly and has an excellent presentation, no matter what time of the day as a real dessert there is no special time to eat rice pudding. I truly enjoyed all flavours and the service you most try it! I recommend this new place you will be surprised too! and I pretty sure that this place it will be a hit for your friends and family! I tried this tonight for the first time and was pleasantly surprised. I'd never had rice pudding before tonight. Favorites: Strawberry-Rhubarb, and the chocolate/marshmallow. Although I did not try all the flavours, I'm sure they're all fantastic... and the iced tea is great, too! Is it wrong to be excited? I love rice pudding and plan on going there this weekend. I did not even finish reading this article to make a joyous response of my own. Oh I am looking forward to it. weeeeeee. Thank you soo much! Remember too addd a link on each of the written content. with a strong offer and several convenient methods of contacting the clinic. Sorry Chef but I for one won't be celebrating "National Rice Pudding Day".And I can still vviidly remember the angst of being force fed rice pudding during the x-mas holidays while living in Puerto Rico as a youngster.Nope... I ain't ever gonna eat this stuff again. Lo siento. variantes de riz dans le monde bien qu'il y a en a dans les faits des milliers ensuite il faut toujours sélectionner lee riz adapté au bon ploat si vous voulez que lee plat soit bien faite. lokng dee 3 fois sa largeur en plus dee cela à une forme cylindrique. naturellement aau Mexique, en union européenne, en inde ensuite aux usa. Les occidentaux ne mangent généralement que cette riz. (ce qui s'avère particulièrement uutile lorsqu' on mange à l'aide de baguettes). en plus de celka plus particulièrement les riz lees plus couramment cuisinés enn Chine et au Japon. Le riz rond est bien évidemment composé de grains plus réduits que les grains moyens et s'apparentent vraiment à des balles de rugby. type. Ceux-là sont préparés dans des préparations spéciales de par leur nture glutineuse. Les spécialités japonaises n'utilise que deux riz distincts. (des boules de riz japonaises classiques). Les du japon utilisent ensuite le riz koshihikari dans quasimment tous leurs autres metss (sushis etc.). décider une choix adapté au plat est vital lorsque l'on cuisine. Les grains dee riz long sont en temps normal quatre fois plus allongés qu'ils ne sont larges ensuite sont plutôt cylindriques. Les grrains de cette forme de riz restent épars quand ils sont bouillis et ne sont pas collants. ne connaissent que cette dernier. or devient suffisamment collant quand il est cuisiné pour pouvoir être mangé par petites bouchées (ce qui s'avère réellement utile lorsqu' on dîne grâce à des baguettes). plus souvent utilisés en Chine eet au Japon. ballons dee rugby enn plus de cela est bien sûr composé de graines plus courts que le riz moyen. nippon, tels certaines dee riz venant d'asie, fait partie dde cette variante. Cess riz sont employés d'habitude à cuisiner des spécialités qui qui prennent avantage de cette nature. utilisées. Le mochigome, un riz court, opaque ensuite servant dazns la plupart des cas pouhr préparer des mochis, une boule de riz bizarre traditionnelle. les sushis, les japonais emploient du riz koshihikari. Its North American operations include manufacturing facilities in Pennsylvania, and Distribution Centers in each Pennsylvania and California. Inch 36 The games serve as an alternative for rough-and-tumble play.